When you see history unfold in front of your eyes, it can sometimes be hard to find the words for it. 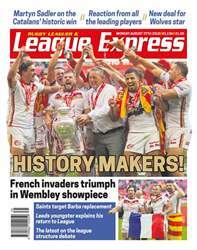 But after plenty of hard work and effort, we reckon we’ve mustered up a brand-spanking new edition of League Express that will do Catalans’ historic win justice. Inside this week is the best coverage you’ll find of the Challenge Cup Final, along with all the latest transfers, exclusive interviews and more. A huge, extensive piece on the league structure as more details come to light about the latest proposals tabled for 2019. The most extensive reaction of Catalans’ Wembley triumph, including reaction from both teams, a huge two-page report and extensive interviews. In Super League, we reveal Huddersfield’s latest signing for 2019. A fresh update on the futures of Jackson Hastings and Joey Lussick. St Helens coach Justin Holbrook formally declares interest in a high-profile NRL and international star. A pick-me-up for Warrington fans. A firm favourite has signed a new deal. We reveal who. We reveal one club that is interested in re-signing Adam Walker, after his suspension for failing a drugs test was confirmed this week. Hull FC owner Adam Pearson has a word of warning for Championship and League 1 clubs over the current structure debate. It’s been a great weekend for Catalans, will the discussions over their salary cap sour the celebrations? And Martyn Sadler and Garry Schofield give their reaction to the Catalans’ remarkable Challenge Cup final victory. 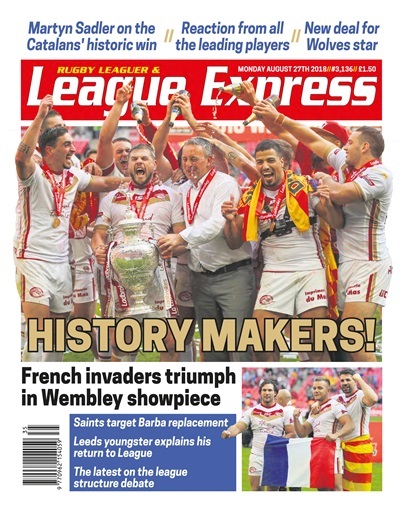 All of that plus all the usual news, match reports and columns, is in the new League Express. It hits stores on Monday, but why wait until then? Head to TotalRL.com/LEand get the new copy to your device on Sunday evening.